Herbert Howells’s chamber music is for the most part a product of his early maturity, circa 1916–1923. In fact he first attracted attention less for his organ and choral pieces (for which he is best known today) than for the Piano Quartet, the Rhapsodic Quintet for clarinet and strings, the Phantasy Quartet and the first and third violin sonatas. Less well known are the Lady Audrey’s Suite for string quartet, and the rhapsody By the Waters of Babylon for solo baritone, cello and organ. Officially, the string quartet In Gloucestershire belongs to this company, since the ‘official’ dates are 1916 for a lost early version, and 1923 for the new work. But there is a little more to it than this: in fact the chronology of In Gloucestershire is involved enough to be something of a musicologist’s nightmare (or dream, depending on his temperament), and I have drawn freely upon Paul Andrews’s researches in presenting the following facts. The first version was completed in 1916 and promptly lost, apparently on a train. (Howells had bad luck with trains. In the early 1950s a disappointed thief threw the briefcase containing the near-completed manuscript full score of the Missa Sabrinensis out of a train window; fortunately most of it was subsequently recovered.) A second version (1919/20) also disappeared, but was reconstructed in the 1960s from a set of parts by the composer and Richard Drakeford, at that time his pupil. Meantime two more versions are known to have come into being: the first represented by another, but incomplete, set of parts in the RCM Library; the second actually by a score and set of (more or less) corresponding parts in the same collection. This, as far as we can ascertain, is the definitive version, and is here recorded for the first time. When it was completed and first performed (if it ever was) remains a mystery, at least for the present. It must have been after 1930, since in February of that year Hubert Foss published a survey of Howells’s music in The Musical Times in which he noted that In Gloucestershire had reached him ‘in manuscript, with no slow movement and an illegible finale, having suffered a number of critical onslaughts from its composer already’. This later date certainly makes sense of the increased maturity of expression I believe we can feel in the first and third movements. Like Vaughan Williams’s Pastoral Symphony, a work to which it is profoundly affiliated, In Gloucestershire arose from thoughts not only of the Cotswolds but also of The Great War. The landscape quality is vivid enough—I once set the opening pages of the first movement to a television documentary which began with some aerial shots of Gloucestershire seen through the early morning mist, and have rarely witnessed so perfect a fusion of sight and sound. Howells once wrote: ‘I have for long years tried to feel, define and express what it has meant, to a potential musician, to have been nurtured in a countryside of companionable hills, two lovely but very diverse rivers, and three magical cathedrals: so that it has seemed that the Severn and the Wye could be flowing in one’s veins, and that the three great churches of Worcester, Hereford and Gloucester had become the Houses of the Mind.’ But Howells was never a writer of picture-postcards and we have here to do with more than the fashionable ruralism of the Georgians. Landscape, the Severn Valley in this instance, is for Howells, as for his poet-composer contemporary-compatriot Ivor Gurney, also strong in human associations, in history, in the human presence as shaping force. In the Pastoral, as in Gurney’s war poems, Cotswold scenes superimpose themselves on French landscapes and vice versa; everything becomes an emblem for everything else. Howells was too sick to be a combatant in The Great War, but his music registers the same agony of mind (with the survivor’s natural guilt and self-reproach all mixed in), the same awareness of landscape as the cosmically indifferent background to slaughter. The design of each movement is of the simplest: all the listener need specifically note is the new strong-featured theme which clinches the climax of the first movement, for this will again recur at climactic points in the third and fourth, grandly releasing the expressive tensions pent-up in the former and turning the entire work upon its heel in the latter. We must also be aware of Howells’s mastery of his medium: song transfigured into instrumental melody, aria and recitative for solo instruments, lavish multi-directional polyphony for ensemble. More than a hint here of the great glowing choral-orchestral canvases waiting to be filled in the form of Hymnus Paradisi and Missa Sabrinensis. 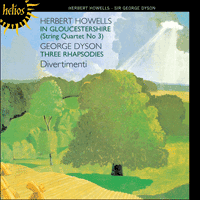 The later music of George Dyson is in a different way no less characteristically English than Howells’s, the main difference being that Dyson, though sympathetic to Vaughan Williams, remained in his own work practically untouched by folksong, plainsong and modality in general. Nor does he follow Elgar, but rather picks up where Parry and Stanford left off. He had a greater flair for orchestration than either, and absorbed elements of chromatic harmony of primarily Delian provenance, but his concept of native Englishness in music was basically Parry’s; and the foundation of Parry’s Englishness was paradoxically German. He built on Brahms; and what Brahms was to Parry’s generation Strauss was to Dyson’s. This is particu­larly significant with regard to Dyson’s Three Rhapsodies, for in them the composer speaks consistently with so accomplished a German—more specifically Straussian—accent that no one would ever guess he was English. There are no intimations of The Canterbury Pilgrims, Nebuchadnezzar, Quo Vadis, the Symphony in G and other works in which Dyson claims the English birthright which is his by legitimate inheritance. The Three Rhapsodies is in fact one of his earliest works, the only one which he allowed to be published. The Carnegie Collection of British Music issued the complete set in 1920 but they were actually composed between 1905 and 1912: the first in Rome in 1905 (Dyson was twenty-two), the second at Marlborough in 1912, the third at Osborne in 1908. In 1904 the Royal College of Music had elected Dyson to the Mendelssohn Scholarship, and he wanted to go to Leipzig to study. Stanford (Dyson’s tutor, as he was later to be Howells’s) would have none of it: ‘Go to Italy, me bhoy, and sit in the sun.’ Dyson did so, and the Three Rhapsodies were the happy result, all inspired by Dante. There is certainly a Mediterranean, if not specifically Italian, quality about the music, with its lyrical grace, bouts of dramatic vigour and overall richness of sonority: the Englishman speaks German with Italian inflections! It is all very youthful in spirit (but then so is the music Dyson wrote in old age), yet disci­plined as well as full-hearted: ‘rhapsody’ does not imply any careless disregard of formal rules and regulations but rather a maximum freedom of treatment within the Classically appointed bounds. (Those interested in the craft of composition would both enjoy and profit by making a detailed analysis of the first Rhapsody’s formal scheme). And it remember when it passid is. Made all the orient laugh. In the first chapter of his book The Progress of Music, Dyson wondered whether the essentially creative spirit of our western music would ever return to the place where many of its abiding foundations had been laid, namely the Church. ‘Will she ever become the mother of all endeavour, the home of all sorts and conditions of artists … will the ethereal beauty of a string quartet secure a corner in one of her transepts?’. To that question this record can return the answer ‘yes’, in relation to one of Dyson’s own works and in a way which he would have been too modest to foresee.